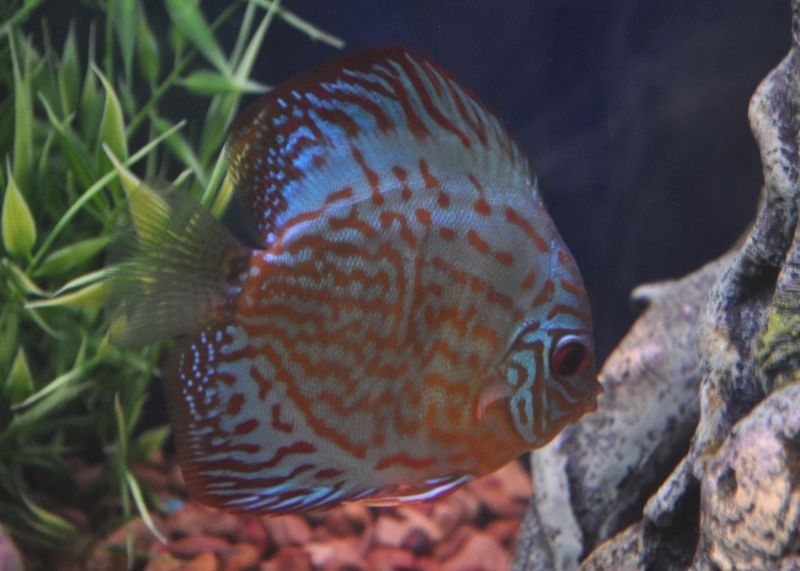 Introduction: Columnaris (Flexibacter columnare) is a very common type of bacterial infection in Discus. It responds somewhat differently than other Bacterial Infections and is not limited to the skin, but affects the gills and sometimes it also infects the internal organs causing liver failure and sepsis. It is always associated with fish that are stressed. The most common causes of stress are shipping, overcrowding, low oxygen, handling injuries, poor water conditions (improper Ph, Hard Water and water that is to cold). Almost all fish have the disease in a dormant state. It will occur in fish that have their immune system weakened due to stress or that are exposed to high levels of the bacteria from other infected fish. 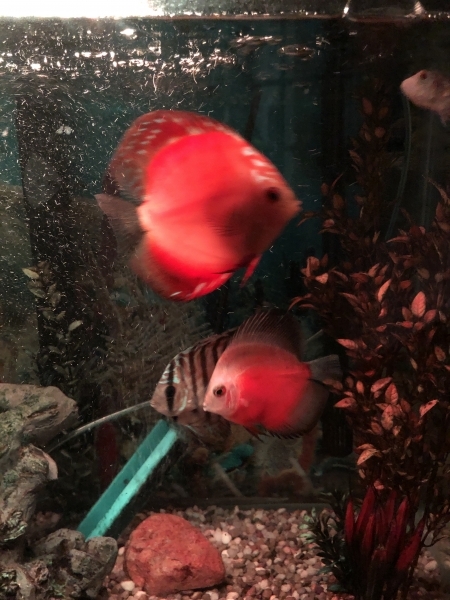 As it is dormant and can become inflamed when stressed, it is EXTREMELY important to quarantine newly shipped fish in a sterile tank after the stress of shipping. If a healthy, but newly stressed fish from shipping is exposed to other fish in an established tank that does not have pristine water conditions, the whole tank can quickly become infected. Likewise, a healthy fish that it is exposed to an infected tank, even if it is largely dormant in some of the other fish, will quickly become infected. Pathology: Columnaris usually starts as a bacterial infection of the skin. Within 12 hours, it will often move to infect the gills and within 24-48 hours it can infect the inner organs. Columnaris can become lethal as quickly as 18 hours and untreated it will be lethal in 50-90 percent of the fish within a week. The most common cause of death is infection of the gills, making it impossible for the infected fish to diffuse enough oxygen through the gill membranes. It is somewhat like the fish getting Pneumonia and suffocating. These severely infected fish will usually die within 24 to 72 hours. Some fish that are able to ward of the infection of the gills will still die from internal organ infections. The two most common types of inner organ infections is liver failure leading to the fish dying from a buildup of toxins and sepsis, which is a total infection of all of the inner organs that will often lead to heart failure. Symptoms: Columnaris in the early stages is very difficult to differentiate from other Bacterial Skin Infections. 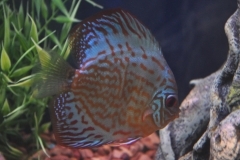 Like Bacterial Skin Infections, Columnaris usually first shows up as a dulling of the coloration in the Discus and in some strains will lead to the fish getting dark. Infected fish will huddle in the corners of the tank and will clamp their fins. The respiration rate of the fish will increase significantly. As the infection develops, unlike most bacterial skin infections, some fish will develop white patchy sores and will have frayed fins with white fuzzy edges. The fish will usually lose most of their appetite. In the final stages, the fish will become emaciated and will often lie on their side at the bottom of the tank. Treatment: Columnaris is a gram negative bacterium. It should initially be treated with a gram negative antibiotic. We have found that the most effective antibiotic is the old standard Tetracycline (which is actually effective against both gram positive and gram negative bacterium) We actually use OxyTetracycline which is more water soluble than Tetracycline. If caught early, most fish will still have some appetite left and the most effective way to administer the antibiotic is with treated food. 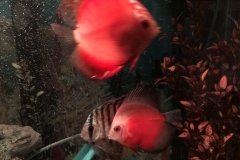 We sell the medicated food, please go to this link: https://www.somethingsphishy.com/flake-fish-food-with-oxytetracycline-p-1360.html By far and away the most effective treatment of Columnaris is with Potassium Permanganate. You must be EXTREMELY CAREFUL with the dosage of the Potassium Permanganate. In even slightly higher dosages than those we list below, Potassium Permanganate is lethal within an hour. We actually use it to sterilize tanks when they are empty before we add fish. If you research the treatment of fish with Potassium Permanganate, you will likely get very confused. Most treatments state the dosage in parts per million and other terms that the average hobbyists will have difficulty translating into a useable treatment dosage. We have described it below in terms that most aquarist will have no trouble in using. We recommend starting with a premix of 30 grams per 1.5 liters of water. You can use a food scale, that can be bought at any grocery store, to weigh it out. You can purchase the Potassium Permanganate powder at the Florida Tropical Fish Farmers Coop website. Once you have created the premix solution, you should treat the tank initially with 7 ml of the premix per 10 gallons of water. You can buy a syringe that uses milliliters at any pharmacy. You will see that the tank turns purple to brown, depending on how much biological material is free floating in the tank. The coloration will slowly turn clear (tan in severely infected tanks). 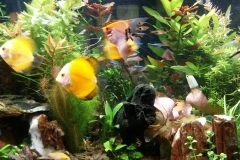 After 24 hours, do a 50% water change and add the water back in treated at 3 ml of Premix per 10 gallons. Repeat this every day for seven days. If you ever mistakenly over dose the tank, you can neutralize it immediately using Hydrogen Peroxide. 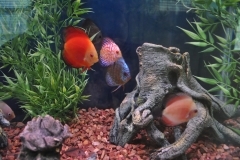 Prevention: All Discus tanks should have UV filtration/sterilization. We sell great UV filters on the website. 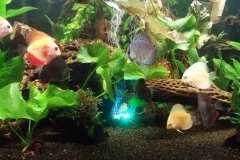 Please go to this link https://www.somethingsphishy.com/aquarium-filters-c-41_77.html UV Filtration is the most important first line of defense. As Columnaris is brought on by stress, any causes of stress should be eliminated or reduced. 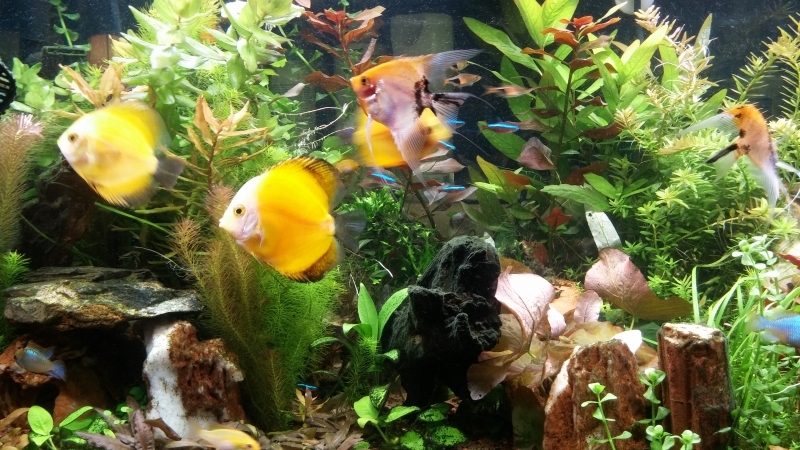 The most common stressors are overcrowding with fish and/or plants and poor water conditions. Once again, we cannot overemphasize the importance of quarantining newly shipped fish in a separate, sterile isolation tank for at least two weeks. 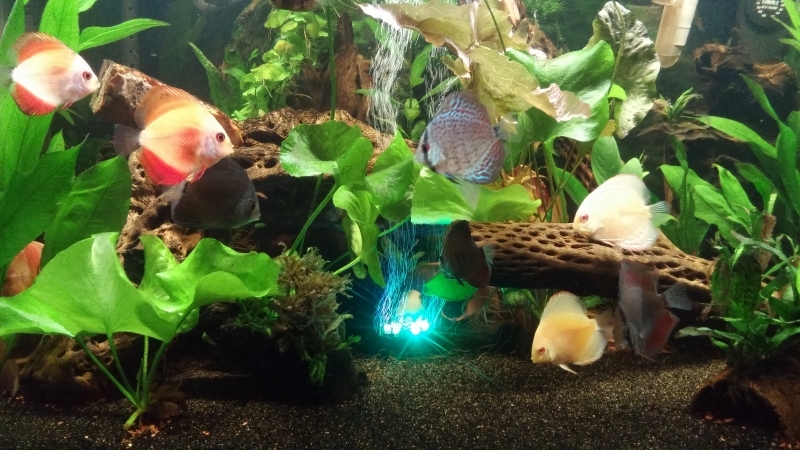 This should be a bare bottom tank with no other fish (other than the ones received), plants, snails, gravel, driftwood or ornaments. It should only have a filter, heater and aeration, all of which have been sterilized.